Over use can cause the tendons to swell and accumulate fluid, resulting in a condition called Tendonitis. 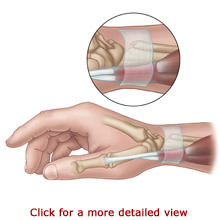 The lining of the tendon sheath can also become inflamed. This condition is called Tenosynovitis. Tendonitis and Tenosynovitis can occur independently or at the same time. Following surgery, you will participate in rehabilitation. You will receive therapy treatments to aid wound healing, reduce swelling and ease pain. You will be instructed in strengthening and stretching exercises. You will perform hand coordination exercises and work towards improving your hand grip and finger pinching skills. 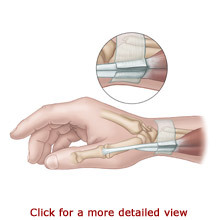 Your therapist will provide you with a splint to position your hand and promote healing.